When selecting these suggested toys for two year old boys I thought about what my own twin boys – who are two years old – like to play with. I know, from first hand experience, the toys they would play with for hours and hours and those toys that have no appeal. The types of toy that are really popular with two year olds are real life toys (kitchens, workbenches etc); physical toys and small worlds (garages, dolls houses etc). It’s from these I’ve suggested toys for two year old boys. Two year olds spend their day as busy as a bee – always on the go and looking for something to do. It is at this age that they are developing their speech and language skills and with this comes the beginning of make believe play. Play sets can stimulate your child’s mind – learning how things work, being creative, making stories up, etc. My suggested toys for two year old boys include physical toys which encourage both fine manipulative skills and gross motor skills. These consist of toys that you sit on and move yourself and toys you sit in and they move you. Both are really beneficial and offer endless opportunities and scope for play. The last group I include in my suggested toys for two year old boys are “real life” toys. These toys represent objects familiar to toddlers. They have seen grown ups using them in real life and want to imitate them. Two year olds will create their own small world play as they help with putting up shelves or fixing the car. These toys let your child build up self esteem and confidence. They promote role play and copying others. Social skills and interaction with adults and peers are encouraged. I have seen how much my own toddlers enjoy these suggested toys for two year old boys. I hope your kids have as much fun with them. My suggested toys for two year old boys come in all sorts of shapes and sizes. A good variety of toy types maintains a child’s interest. When looking at toys for 2 year olds make sure they are age appropriate as toys that are for older kids can be unsafe. Toy parts should be bigger than your child’s mouth, to avoid the risk of choking. Also ensure the toy is not too heavy as if it is picked up and dropped it may harm you or your child. It’s important that these toys are age appropriate. Toys designed for older kids can be unsafe for toddlers. My boys get bored with “baby” toys. 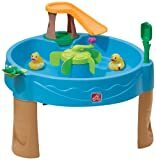 I’ve looked for good quality toys with great design and sturdy materials. Boys work their toys very hard and we want these toys to last. Safety is important and you need to check for small parts that your two year olds could put in their mouths. Finally I suggest that they should be as noisy as possible!! This certainly seems to be the major factor that appeals to my two boys. This was the foundation of creating a brand of toys to help preschool minds develop. In 1967 Victor Bertrand and his wife launched a toy distribution business known as Ritvik Toys Inc.
By the early 1980’s their vision had grown and Mega Bloks was born. This simple, interlocking building block system was officially launched as Mega Bloks in 1985 and took the toy world by storm. Mega Bloks is one of the top ten toy brands in America and its popularity is due to the safety of the blocks and there durability. They offer children the encouragement to create and discover new things whilst gaining fun and enjoyment. Many of our suggested toys for two year old boys (especially the noisy ones!) need batteries. Check what you need when buying these toys. This garage will keep many little people happy with all the activities and little extras that come with it. This fantastic garage features a fix up centre, with elevator, car wash and gas station, and lots of other areas to fix and restore your cars. This set is completed with a car, tow truck, a mechanic and a little man. It is just the right size for little hands to get busy and make up their own adventures. This garage is rich in play opportunities as your child explores and discovers new sounds and areas. It will really encourage learning and make believe play. 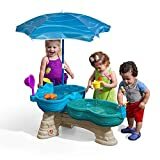 My two year old twins have a sand and water table. On occasion (when they have been really good and the weather is nice) we swap the sand for soil and we put cars, trucks and trains in and build dirt roads. My boys will play for a good couple of hours with the table, adding water and more soil. They have a ball playing in there and I have a ball watching them. At the end of their play we get a bucket of warm soapy water and clean all our toys – then we hit the bath!!!!! This battery powered car looks even better in real life. It comes complete with 2 forward speeds, double seat, two seat belts, reverse mode and a radio with a 5 song play list. What else could your two year old wish for? One of this toy’s best features is that it will literally last them for years. Boys maybe aged six or seven by the time they grow out of it. This toy will benefit your child immensely as it improves so many developmental areas. Hand and eye coordination is needed to steer it. Your child will have to think about and work out how to start the car and stop it. It is quite bulky to store but a great toy . This lively toy is a well known toy from the seventies and is still as popular now as it was then. It comes complete with flashing lights and plays various types of music. 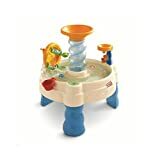 Your child’s large motor skills will be developed as they use their balance and arm control to work this toy. It also uses up some of that surplus energy! This toy requires AA batteries that are not included. This is a fabulous toy for any two year old. It is a sand and water tray split by a fantastic castle that is surrounded by a moat. It comes complete with a princess, a water squirting dragon, a knight, boat and several other items. 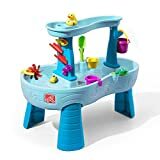 The table allows your child to experience a multi sensory interactive activity as they play with the sand and water with friends or with the play pieces. It provides rich make believe, discovery and exploratory play values. Watch as they pour the water and see how it spins the wheel. This is an ideal toy and worth every cent. 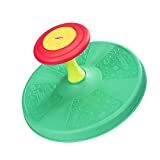 This was the first toy I considered when selecting suggested toys for two year old boys. This durable workbench is just like Daddy’s! Your little one will be able to use these toys to build a birdhouse and help with any odd jobs around the house using the life like drill, screwdriver, hammer, etc – complete with noises! Your youngster will gain many hours of fun and enjoyment from this toy as well as developing their imagination and creativeness. Their hand and eye coordination will develop as they try to put the bolts and screws together. Because Daddy or Grandad works with tools like these at home your child will be familiar with them and find them appealing. It offers your toddler an opportunity to develop their imagination by letting them create stories. It encourages speech and language as well as social skills as they ask others questions and discover new words. This garage can be used with their other cars and trucks creating lots more fun. I particularly like this great toy as it is very sturdy, durable and easy to clean. 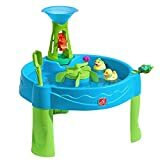 Is there an alternative to Suggested Toys for Two Year Old Boys ? You’ll find some interesting alternatives to Suggested Toys for Two Year Old Boys in our review of Toys for Boy Toddlers or you may select another toy category from the sidebar. This delightful maritime rocker is outstanding. It is a real treasure. This toy has a high back so your child is safe in the seat. it is made up from beautiful shades of maritime blue velvet and comes complete with portholes that light up and a funnel that makes noises. Your two year old will gain confidence as they learn how to balance and rock at the same time and then gradually increase speed. They will love the adult interaction they will gain from this toy as you will be able to play with your child in a different way. This toy is expensive but is well crafted and quite unique.